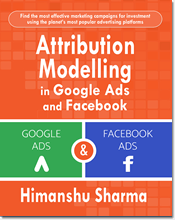 I have written this article under the assumption that you are familiar with, how Google Tag Manager and its variables work. If you are new to variables in Google Tag Manager then read this article first: Google Tag Manager Triggers and Variables – Beginners’ guide. 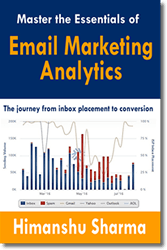 In GTM there are tags which are based on ‘Classic Google Analytics’. We call such tags as ‘Classic Google Analytics’ tags. In order to maintain backward compatibility, such tag type is still available in GTM. 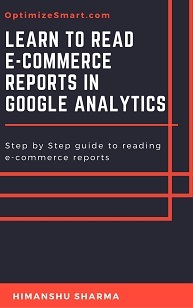 ‘Basic Configuration’, ‘Campaign Tracking’, ‘Campaign Variables’, ‘Domains and Referrers’ etc are examples of Generic Google Analytics settings. 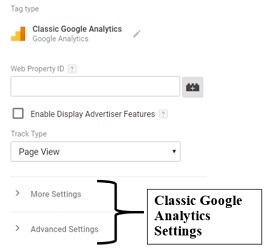 In most cases, all of these settings need to be set and maintain with same configuration options across all tags of type ‘Classic Google Analytics’. 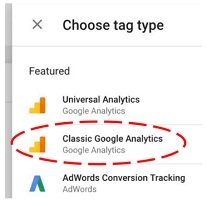 But this need to be done manually for each tag because the ‘Google Analytics Settings’ variable through which you can set, change and apply Google Analytics Generic settings across all tags from one central location is not available for ‘Classic Google Analytics’ tags. 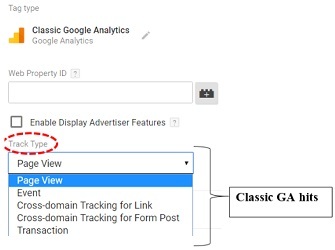 So if you are using ‘Classic Google Analytics’ on your website or any tag of type ‘Classic Google Analytics’ then you would first need to migrate your existing tracking from Google Analytics to Universal Analytics before you can use and take advantage of the ‘Google Analytics Settings’ variable in GTM. 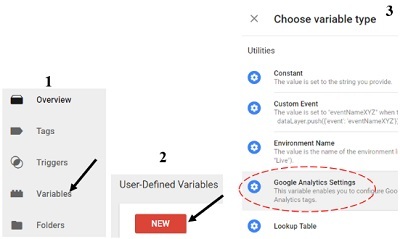 Remember, the ‘Google Analytics Settings’ variable is available only for ‘Universal Analytics’ tags. It is not available for any other tag type. 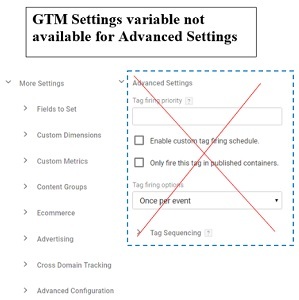 In most cases, all of the configuration options under ‘More Settings’ (like ‘Fields to Set’, ‘Custom Dimensions’, ‘Custom Metrics’, ‘Content Groups’, ‘Ecommerce’ etc) need to be set and maintain for all tags of type ‘Universal Analytics’. Manually updating each and every ‘Universal Analytics’ tag to make sure all such tags have got same basic configuration options is time consuming and not practical esp. 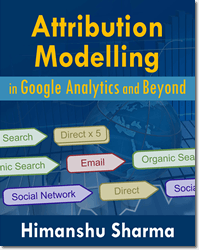 if you have got dozens or even hundreds of ‘Universal Analytics’ tag. 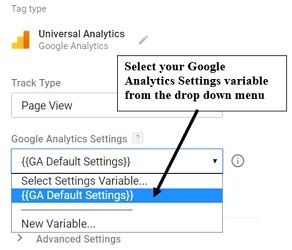 Here the ‘Google Analytics Settings’ variable come handy. 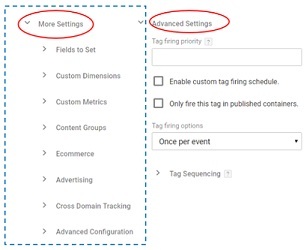 Through this variable you can set, change and apply any or all of the configuration options under ‘More Settings’ (like ‘Fields to Set’, ‘Custom Dimensions’, ‘Custom Metrics’, ‘Content Groups’, ‘Ecommerce’ etc) from one central location to all tags of type ‘Universal Analytics’. 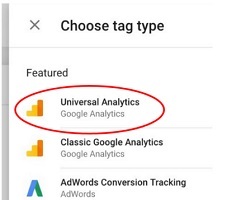 Step-1: Login to your Google Tag Manager account and then edit the tag (of type Universal Analytics) whose generic settings you want to use across all other tags of type ‘Universal Analytics’. 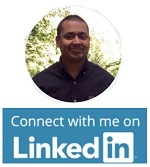 Most likely this would be tag you used to install ‘Universal Analytics’ on your website. Later, you will use this ‘tracking ID’ while creating a ‘Google Analytics Settings’ variable. Take a note of these settings. Later, you will use the same settings while creating a ‘Google Analytics Settings’ variable. 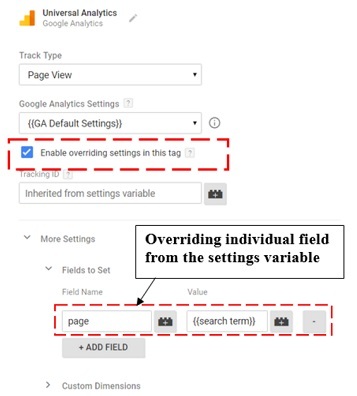 Step-4: Create a new ‘User defined variable’ of type ‘Google Analytics Settings’. 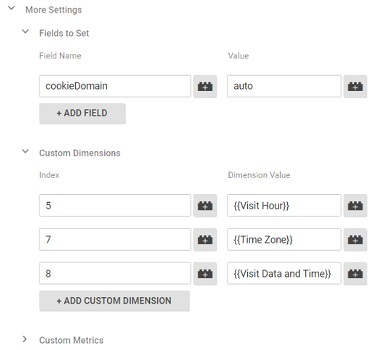 The ‘cookie domain’ field is pre-populated with the value ‘auto’. 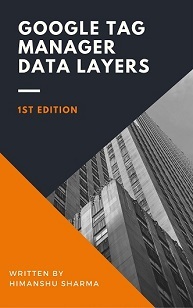 ‘auto’ is a configuration parameter which automatically setup cross domain tracking between primary domain and its sub-domain(s). 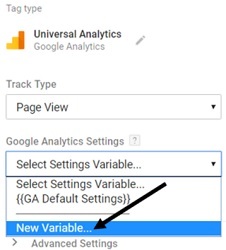 Step-7: Once you have copied all the settings from your ‘Universal Analytics’ tag to your ‘Google Analytics Settings’ variable then click on the ‘Save’ button. 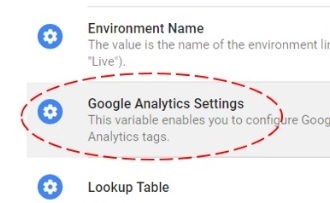 You have now created a new Google Analytics settings variable which store generic settings for your universal analytics tags. 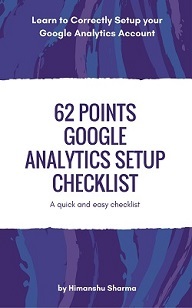 Note: You can create several Google Analytics Settings variables. Step-2: Click on the ‘Save’ button to save the new setting for your tag. 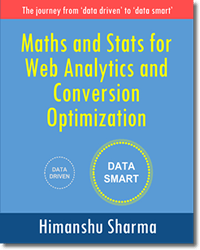 Step-3: Repeat step 1 and 2 for each tag of type ‘Universal Analytics’. 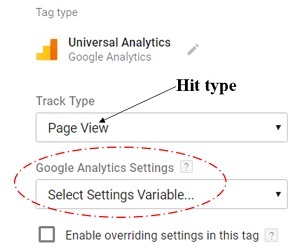 Note: You can use only one Google Analytics settings variable at a time for a Universal Analytics tag. 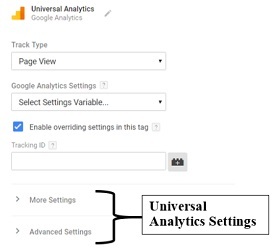 Step-1: Edit the universal analytics tag which use the Google Analytics settings variable. Step-3: Click on the ‘Save’ button to save the tag with new settings. 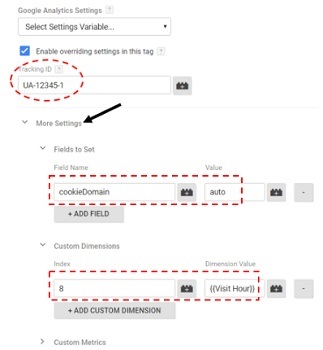 Step-4: Repeat steps 1 to 3 for each universal analytics tag for which you want to use the Google Analytics settings variable but at the same time override some of the fields/settings with custom values. 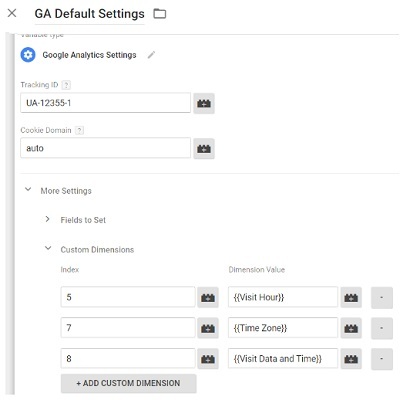 Note: The fields which are not overridden continue to use the settings defined by the Google Analytics settings variable. 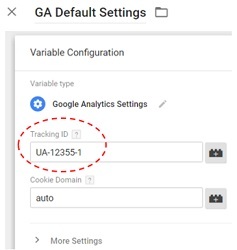 When a universal analytics tag is configured to use ‘Google Analytics Settings’ variable then all its fields under the ‘More Settings’ section along with ‘tracking ID’ and ‘cookie domain’ fields inherit values from the ‘Google Analytics Settings’ variable (unless they are manually overridden with custom values). Step-2: Click the checkbox named ‘Enable overriding settings in this tag’ (if it is not already checked). Step-3: Click on the ‘More Settings’ link. 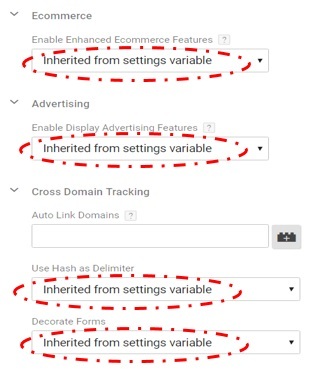 Any field whose default value is ‘Inherited from setting variable’ has inherited its value from the Google Analytics Settings variable. 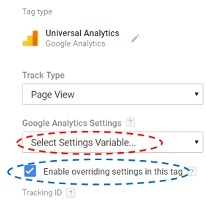 Note: In order to maintain backward compatibility, the checkbox named ‘Enable overriding settings in this tag’ is selected by default for all universal analytics tags which are currently not configured to use ‘Google Analytics Settings’ variable. 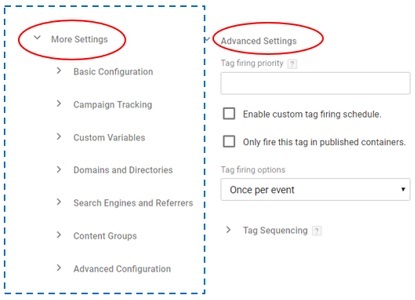 However if you are creating a new universal analytics tag, then the checkbox named ‘Enable overriding settings in this tag’ is not selected by default.